Suffolk County Crime Stoppers and Suffolk County Police Fourth Squad detectives are seeking the public’s help to identify and locate the man who stole a wallet in Kings Park earlier this year. 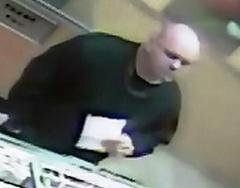 Kings Park, NY - December 18th, 2014 - Suffolk County Crime Stoppers and Suffolk County Police Fourth Squad detectives are seeking the public’s help to identify and locate the man who stole a wallet in Kings Park earlier this year. A man stole a wallet that was left on the counter at Subway, located at 56 West Main St., on February 28, 2014 at approximately 5:45 p.m. A credit card in the wallet was later used at a Deer Park gas station. Subject: LongIsland.com - Your Name sent you Article details of "Man Wanted for Stealing Customer's Wallet at Kings Park Subway"